The general rule to help make this decision is if you are not doing enough volume with a particular piece of equipment to support its purchase then equipment rental may be the best option. Factors which may be considered in varying from the above rule include the convenience of having a particular piece available when you want it and having a tool not fully supported by your current volume but using it to build your business. We are knowledgeable in what volumes support purchase of Finn equipment and would be glad to discuss the options with you. 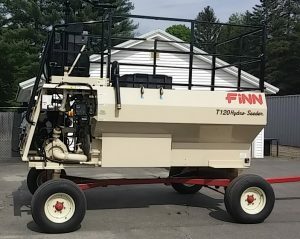 Why should you rent Finn equipment from hydrograsscorp.com? in the area where this equipment is being offered for rent. No one wants you to have a more trouble free and enjoyable rental experience than we do. We hope that many of you will become Finn owners in the future. by factory trained technicians in a factory authorized service facility. Our equipment will not let you down. If you have a problem with the use of the equipment we are only a phone call away. If you are interested in purchasing equipment that you are renting we can credit a portion of your rental toward purchase of either new equipment or the piece you are renting. by people who know the equipment. You will operate the equipment efficiently. Need hydroseeding materials for your hydroseeder rental? We have materials and knowledge to give you professional results the first time out. We offer one stop shopping for your rental equipment and material. Weekly and Monthly rentals in New England and New York. Call us with your needs.